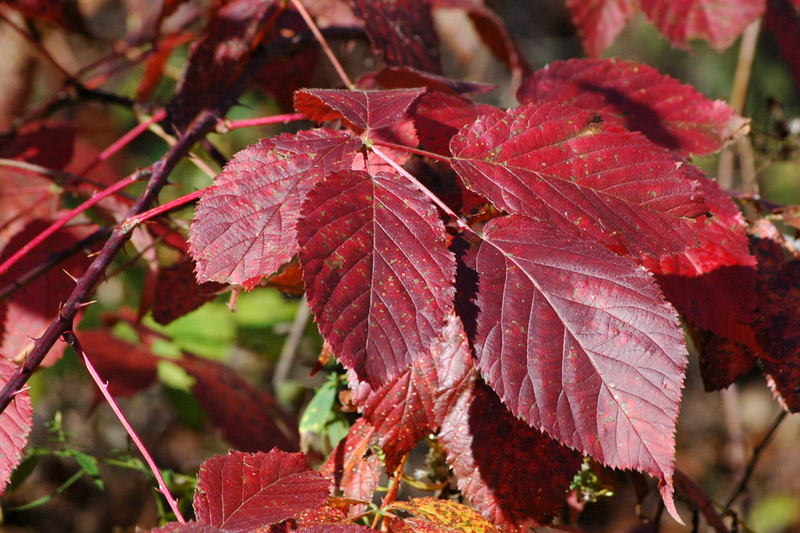 October brings rapid seasonal change: peak fall color and leaf drop, animals and insects going into dormancy, birds migrating from—or to—our area, seed dispersal, decreasing day length, falling temperatures, and possible frost. Less obvious changes take place along twigs, within plant crowns, and under the soil surface. Buds, rhizomes (underground stems), and root systems grow and develop, laying a foundation for next season’s growth. This month’s gardening tasks include planting remaining plants from our nursery and cold frames. They will hold their current size after planting but grow rapidly next spring. We may transplant native species from one garden to another as called for in our garden design. A plant may be large enough to divide when we move it. Aside from trimming plants to keep paths clear, we leave native plant material untrimmed through the winter. This provides food and shelter for birds and small mammals, as well as overwintering sites for insects. Forms and colors in a winter garden are varied and attractive. 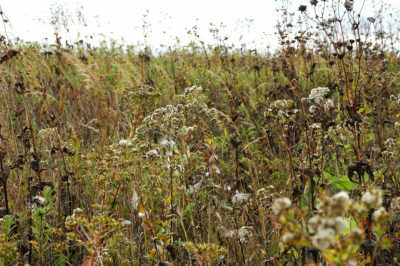 During fall, the native plant garden literally holds seeds for next year’s growth. Seeds from species that bloom late in the season can be collected and spread over existing gardens or in new areas. Store seeds in paper bags in a cool, dry place until planting time. Seed spreading is best done in November before the soil begins to freeze. The freeze-thaw cycle brings fresh seed into contact with small crevices in bare soil. Winter weather provides the cold treatment that many seeds need to break dormancy. For the gardener, it’s time to assess, look ahead, and slow down. What worked well in your garden this season? What didn’t? Are there gaps to fill or changes to make for next season? Measuring areas, counting “spaces,” and recording your ideas for new additions will serve you well when you propagate or purchase new plants. Mark future plant locations in the garden (using sturdy color-coded stakes or stakes marked with pencil, which will not fade), or record places for new plants on a sketch or map. Slowing down, you might notice October-blooming natives like witch hazel (Hamamelis virginiana) or harebells (Campanula rotundifolia). Autumn leaf color variations are striking, as are branching patterns revealed after leaves fall. Even familiar plants and garden spaces look “new” as the light changes and you closely observe features that mark the end of one season and the promise of the next.